Guyana’s top performing students at the primary, secondary and tertiary levels were honoured on Friday, when the Ministry of Education held its 22nd National Awards Ceremony. According to a Department of Public Information (DPI) report, Minister of Education Nicolette Henry gave the feature address at the event, which was hosted at the National Cultural Centre. “Notwithstanding the tireless contributions from those who would have supported you through this journey such as teachers, mentors, lecturers and your paramount cheerleaders, your parents, you have triumphed,” Henry was quoted as saying. Henry, the report said, noted that the awards were started in October, 1990 as a way of acknowledging students that have done exceptionally well academically and those who achieved certain scores thresholds in the different examinations. She said that the exercise also serves the purpose of encouraging students to strive for excellence. “When the ceremony first began in 1990, only students with outstanding performance at the GCE Examination and the CXC Examinations received awards. Today I am proud to announce that thirteen awards have since been added which range from the National Grade Six Assessment (NGSA) to the Cyril Potter College of Education Examinations. Honours are awarded from primary all the way to tertiary, and who knows maybe one day, even our nursery babies may be awarded,” Henry said. She noted too that special awards were also presented to outstanding Caribbean Secondary Education Certificate (CSEC) students with disabilities. Presidential Scholarships were also awarded to the top Caribbean Advanced Proficiency Examination (CAPE) students Aadilah Ali and Rajiv Muneshwar, both of Queen’s College, as well as top CSEC students Christian Pile, of Queen’s College, and Shakira Bholo of Anna Regina Secondary. Shania Khan, of Three Miles Secondary, was awarded the Desrey Fox Scholarship. 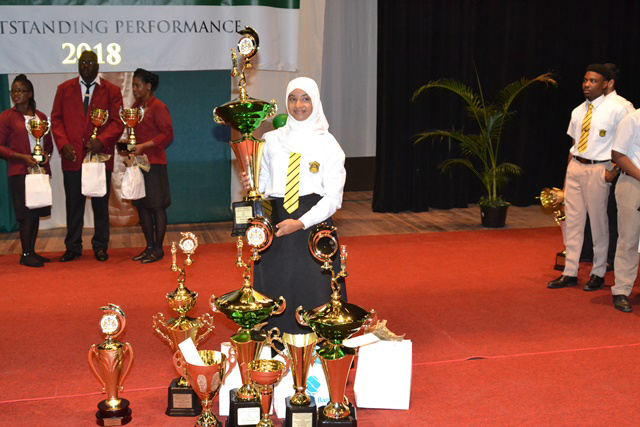 Ali also won awards for being the Best CAPE Performer, Most Outstanding Overall CAPE student in the Caribbean, and Most Outstanding in Natural Science in the Caribbean, while Muneshwar was awarded for being the Most Outstanding in Mathematics in the region. Pile was awarded for being CSEC’s Best Performer. Awards were also bestowed upon the Thomas Moore Primary, Sand Creek Secondary School and New Amsterdam Secondary for being the most improved primary, junior secondary and senior secondary schools. This year’s awardees at the primary and the secondary levels were: NGSA Best Performers Naila Rahaman (Westfield Prep), Marks Arthur Roberts (New Guyana School) and Kaydee Ali (Success Elementary); CSEC Best Junior Secondary School Performers Shakira Bholo (Anna Regina Secondary), Salma Majeed (ISA Islamic School), Camecia De La Cruz (Anna Regina Secondary), Begum Baksh (Anna Regina Secondary), and Darshanie Jadubir (J.C Chandisingh Secondary); CSEC Best Senior Secondary Performers Christian Pile (Queen’s College), Areeb Ali (Queen’s College), Haema Dasrath (Queen’s College), Aarti Hooblall (Queen’s College), Leshanna Bindah (Queen’s College), Reseda Hack (Queen’s College) and Yashoda Samaroo (Queen’s College).